All Things Dog Blog All Things Dog Blog: Congratulations, Kodi! 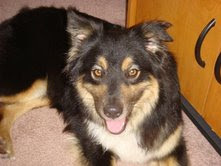 Kodi, pictured here, is a sweet foster dog who has now found a forever home. This is the sort of Cinderella story I love. Her foster mom found a gentleman who liked her interest in Frisbee play and took over Kodi's foster care. He did this to help promote Kodi among other Frisbee dog lovers, since that was his interest and passion. Surprise! 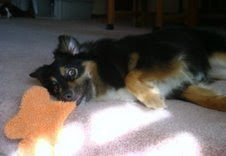 Kodi's new foster dad fell in love with Kodi's playful affection and adopted her for his own. Kodi now has a family to call her own. Aren't success stories wonderful?! If you're interested in adopting a dog who needs a home, check out Fluffy and Zoey in the sidebar of the blog. They are available and adorable. What's not to like about that? !